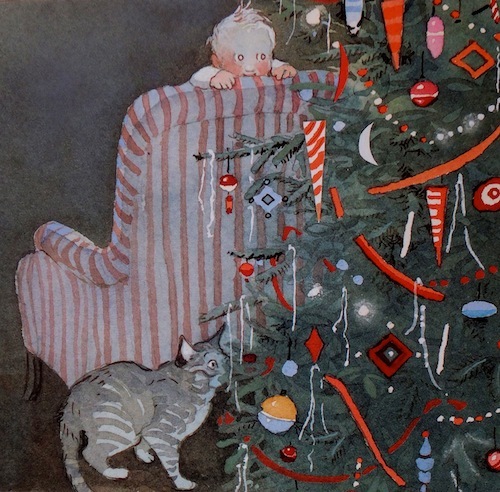 For the past few years, I’ve updated my list of favourite CHRISTMAS picture books, which itself is built upon a comprehensive list of all the books in my collection that are in some way related to Christmas (49 and counting.) In my house, Christmas encompasses a very broad range of experiences, from sprinkles to snow, family, friends, all the Who’s down in Whoville, chocolate gingerbread, fancy exterior lighting, Boney M, and of course, books. 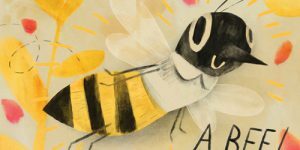 Some years are lean, illustratively speaking, while others offer a jolly good selection of festively inclined picture books, as is the case this year. And so, I am pleased to add seven new titles to the list, though only three were published in 2013. 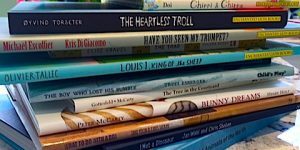 The neverending search for outstanding picture books, Christmas or otherwise, is an exercise in time travel. Some books hide in the past, others hide in plain sight. The only criteria: they must knock my chestnuts off. One could argue that Christmas and everything that springs from it is in some way, an origin story. Without Christ, there would be no Christmas, reflected in the number (but not necessarily the quality) of nativity stories published each year. Other characters have since joined the cast, demanding their own origin stories. Jon Agee’s LITTLE SANTA (Dial-2013) takes us on a journey back to the North Pole, when the jolly old elf was just a jolly young kid. 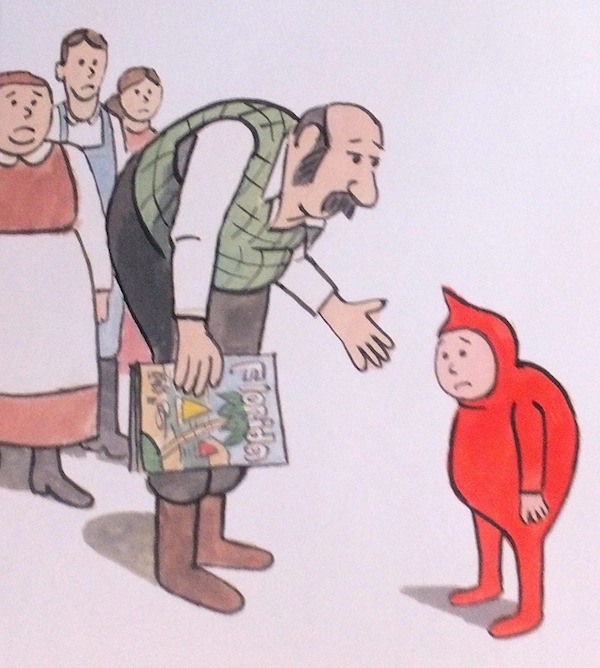 With be-twinkled storytelling and a frosting of charm, Jon Agee gives us the Boy Destined To Be The Man In Red. Some people are born to their careers, and young Santa shows early signs of his philanthropic future, squeezing down chimneys and rocking the red onesie long before it was fashionable. The youngest of seven children (Larry, Mary, Willy, Millie, Joey, Zoe and Santa), the boy is clearly different from his family. While others grump about their lives in the North Pole, Santa Ho Ho Ho’s through his daily chores, finding joy in his arctic home: decorating trees, making snow angels and baking gingerbread. When he discovers his parents are intending to move the family to Florida, Santa asks his father, “Won’t you miss all the pine trees and the icicles and the miles and miles of snow?” “NO”, they answer (surprisingly), and continue their packing while a terrible blizzard buries the Clause’s tiny cabin in the snow. Without a shred of hesitation, Santa offers to ‘shimmy up the chimney’ and get help. 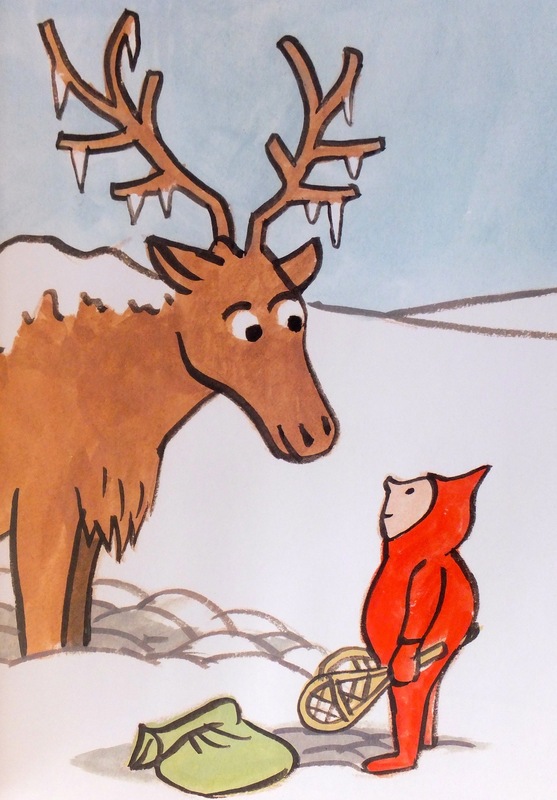 While snowshoeing through the tundra, he discovers a reindeer and a houseful of elves, who build Santa a sleigh, which he uses to rescue his family. The rest, as they say up north, is history. And darned good storytelling. Jon Agee‘s illustrations are as affable as his words. 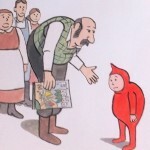 There is great joy in Little Santa, the book and the spritely young fellow it chronicles. Simply drawn with just the right amount of detail, the illustrations are reminiscent of Bill Peet and William Steig, two artists who, like Agee, were masters of humourous characterization. Trained at the Cooper Union School of Art in New York City, Agee studied painting, sculpture and filmmaking, but was most interested in drawing cartoons. 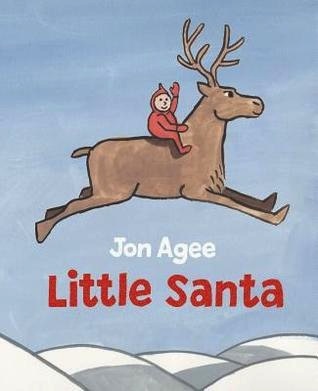 Little Santa, the latest publication in a long list of beloved children’s books, perfectly embodies Agee’s comic sensibility; it is a fun, and funny tribute to a jolly character. Mr Agee is definitely on Santa’s ‘Nice’ list this year. THE STAR (Ute Blaich & Julie Litty/Minedition-2012) is one of those books I bought based on the cover and a bit of image browsing on the internet. 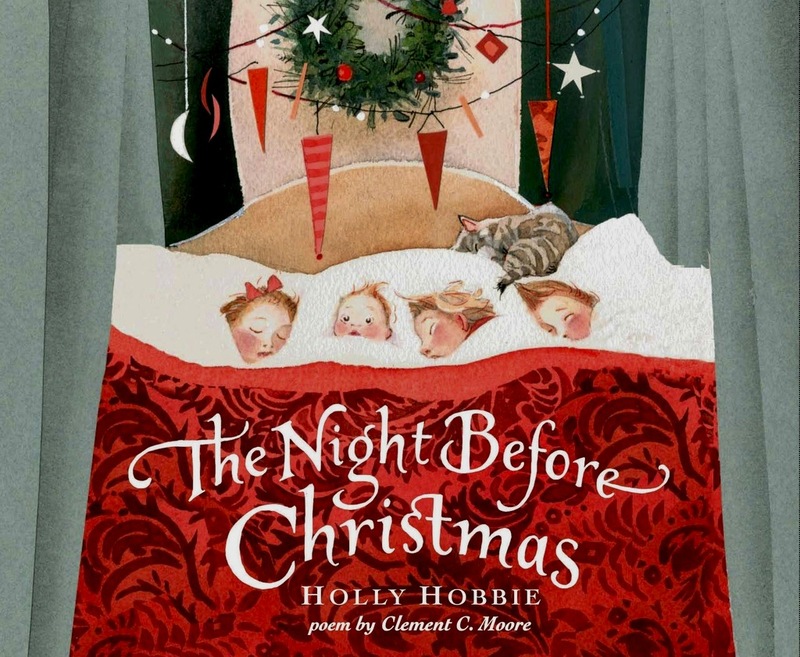 I wasn’t even sure if it was a Christmas story (it is), but the illustrations were captivating, and I had no choice but to bring this book home. 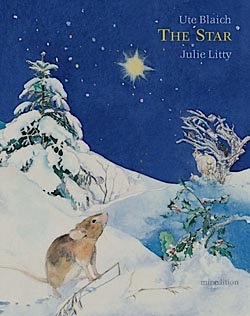 The Star is a miniaturized and slip-cased reprint of the original, published in 2001. A gift book, in other words, and it is a tiny treasure. On Christmas Eve, a group of animals gather near a tree in search of food. They are hungry, and there is nothing to eat, other than each other. As the mouse looks around nervously, an owl explains to all assembled (a raven, grouse and sheep) that it’s a special day, and then points to the sky. “It’s the Star of Bethlehem.” he says, recounting the story of the nativity. “He was not only the son of man, he was the son of God. And what made him truly remarkable was that he was not unkind or angry or hurtful. He was a good person.” This example of love, celebrated yearly, is the reason why the owl won’t eat the mouse, but the animals remain distrustful of humans. Just then, an old man and a child arrive on a horse-drawn sledge, with two sacks of food for the animals. I will admit to a tear or two reading The Star, as I am always moved by kindness towards animals, any time of the year. 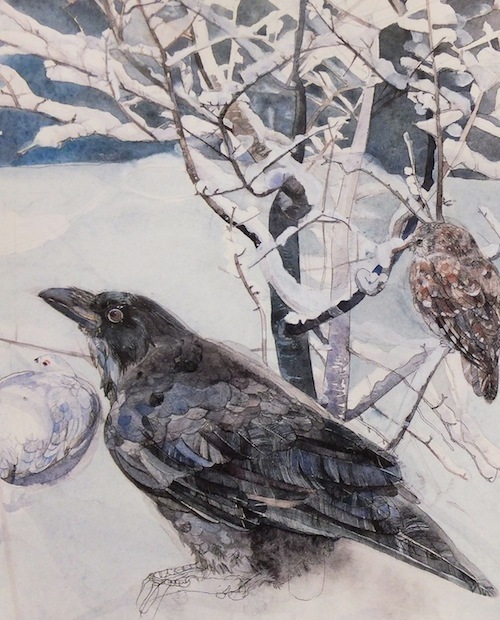 The delicately rendered and stunningly beautiful watercolours (especially the ravens) by Julie Wintz-Litty elevate The Star to the top of my list of Christmas books. Born in Annecy, France in 1971 and educated at the Art Academy and Emil Cohl College in Lyon, Wintz-Litty was unfamiliar to me until ‘discovering’ The Star. Although I am not particularly drawn to the overtly religious aspects of the season, the story by Ute Blaich is very gentle, focused primarily on the animals who, as the author alludes, are wanting for kindness all year around, not just Christmas. In a similar vein, THE MESSAGE OF THE BIRDS (Kate Westerlund & Feridun Oral/Minedition reprint-2013) is an exquisitely illustrated and deeply moving take on the traditional Christian tale, with a twist. 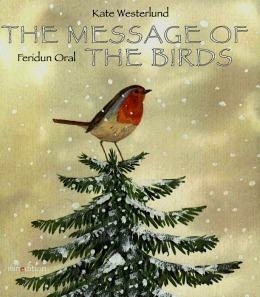 An old owl recites the story of the birds who observed the birth of Christ, hearing words in the baby’s gentle cooing. The birds carry the special song throughout the world, but as the owl laments, no one listens anymore. A robin suggests singing it for children. A beautiful two-page illustration follows of all the different species of bird flying off in every direction to sing the forgotten song. Child after child hears the song, and more importantly, hears the words, joining hands across the world. The message of the birds? Peace on Earth. The last page of The Message of the Birds has those words in many languages. 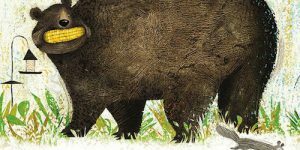 It’s lovely, and sentimental, but the bird-centric story by Westerlund accompanied by Oral’s gorgeous illustrations is a heart-thumping stunner. Kate Westerlund was born in Florida, but has lived in Salzburg, Austria for the last 20 years. Feridun Oral was born in Turkey, and currently lives in Istanbul. Some stories never get old, like perennial favourite THE NIGHT BEFORE CHRISTMAS (Clement C. Moore.) 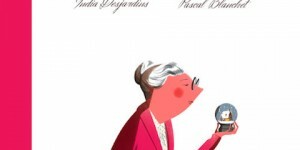 It’s one of those framework type of books, like The Snow Queen, or The Frog Prince, where the story is so solid and well-known, illustrators come back to it year after year, adding their own special visual interpretations. This year, two versions by two very different illustrators. “Not a creature was stirring, not even a mouse.” Well, that might not be true. 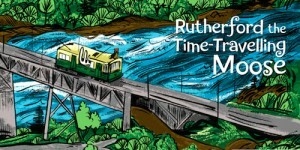 Barbara Reid, recipient of both the Order of Canada and the Governor General’s Award for Illustration, has once again given us an extraordinary picture book worthy of this, or any season. 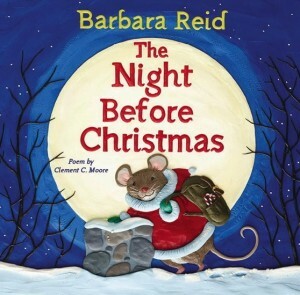 In Reid’s version of The Night Before Christmas (North Winds Press-2013), the mice are indeed stirring, peaking out windows and over bannisters as Santa arrives on Christmas Eve. 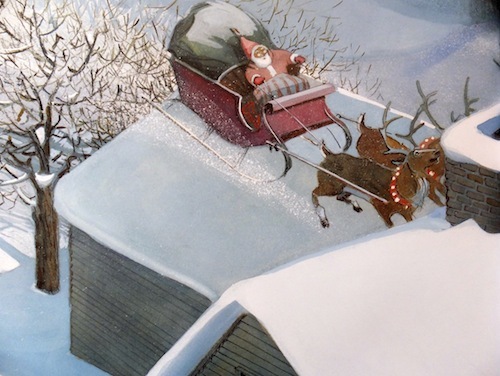 Like all the characters in this reimagined classic, Santa is a tiny mouse, but the reindeer pulling the sleigh are full-size, as are their hooves clattering and knocking snow off the roof of the log home nestled in the woods, awakening the children. Illustrated in Reid’s signature plasticine, the cozy domestic scenes are so finely crafted and exquisitely detailed, I spent more time with this book than any other this season marveling at the mouse-sized furnishings made of found objects like penny plates, popsicle stick shutters, acorn cribs and birch seed decorations. 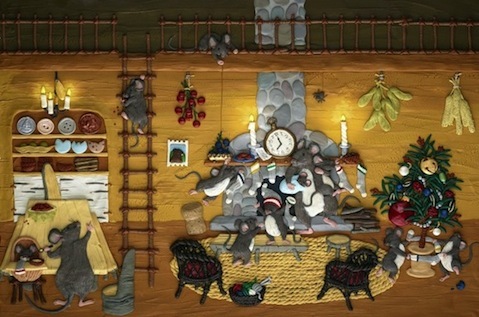 Each page holds secrets that are slowly revealed after repeated viewings, and though I would not want to share my home with a mouse, I did wonder what it would be like to live in this warm and playful house. Reid’s visual storytelling is so strong, it’s easy to lose sight of the actual words by Clement C. Moore, but we know how it will end, regardless of who is sporting the red suit…and who may, or may not have a tail. 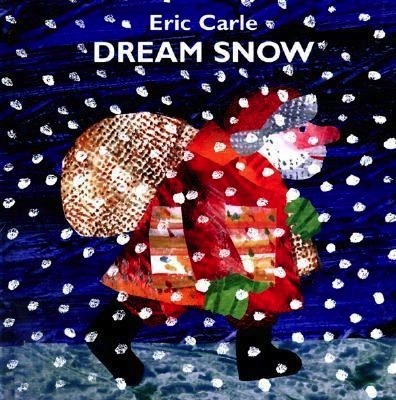 Ever popular Eric Carle published DREAM SNOW (Philomel Books) in 2000, but only now has it materialized in my consciousness. I blame my ignorance on years of festively decorated (and cognitively damaging) sugar cookies. As the title suggests, an old and incredibly literal farmer dreams that snow has covered not only himself but his five animals (named One, Two, Three, Four, and Five.) In true Eric Carle fashion, Dream Snow is more than a collection of words and art. 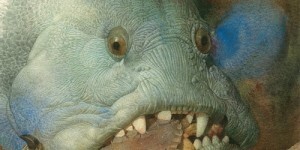 A clear plastic page speckled with snowflakes and a vaguely animal-shaped pile of snow precedes each illustration, so as a page is turned, the animal is revealed. When the farmer awakens, he dons a Santa-esque red suit, slings a sack over his shoulder and heads outside to decorate a tree, which jingles with song when a button is pressed. Like all Eric Carle books, Dream Snow is very tactile. The cover has raised snowflakes, and the plastic smells like barbie dolls (always a plus.) Carle’s colourful, collage-style illustrations and inventive, interactive design have all senses firing, which is just as Santa would have it. 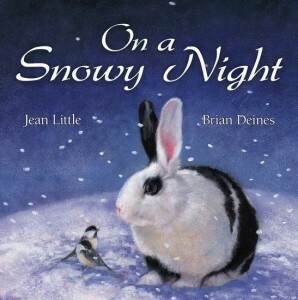 ON A SNOWY NIGHT (Jean Little/Brian Deines-2013) Previously reviewed in 32 Pages, On a Snowy Night is a hard, but ultimately thoughtful and stunningly beautiful book by two of Canada’s greatest artists. A young boy leaves his pet rabbit outside on a cold winter night. It is a moment of forgetfulness on his part, but the consequences for the rabbit are dire. Thankfully, it is Christmas Eve, and the woodland animals who would normally be predatory instead take pity on the shivering bunny, providing him with food, warmth, and a way home. 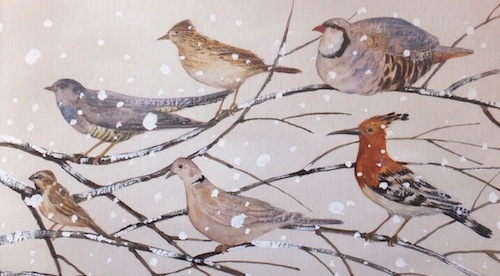 In soft oils, Deines captures these creatures down to their snow-flecked fur and feathers, as well as the gorgeous winter landscape that shrouds them in tones of white, blue and purple. It is solemn and deeply moving, as befits a book about Christmas Eve, an abandoned rabbit, and an act of kindness on a snowy night. 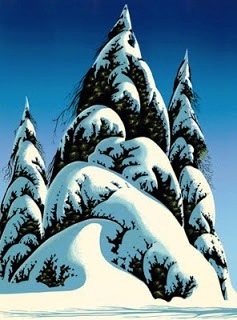 MERRY CHRISTMAS: THE COMPLETE CHRISTMAS CARD ART OF EYVIND EARLE (E.Earle-1996) is my Christmas folly. Weighing in at one and a half German Shepherds, this book is not so much a door stop as a door. I need a pedestal to display it, and a back brace to lift it. 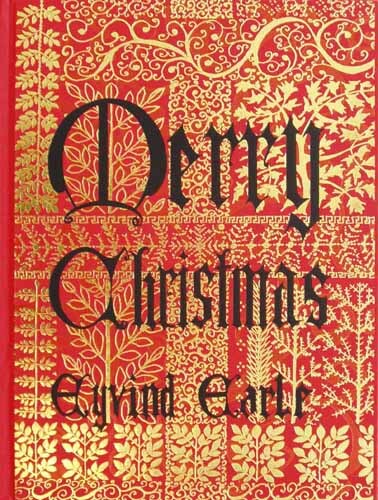 Printed on unusually thick, glossy paper, this collection of Earle’s Christmas cards, which total somewhere in the vicinity of 800 individual cards, is an amazing thing to behold. I am completely gobsmacked by the beauty of his illustrations, and in particular, the incredible output of artistic work over a much-lauded career as an illustrator and Disney animator. Merry Christmas is a true coffee table book, if your coffee table is reinforced with steel. That’s it…as far as I know, for 2013. 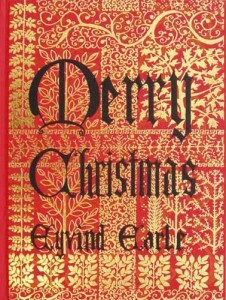 Click HERE for a complete list of all my recommended Christmas and Christmas-related books. In the immortal words of Chevy Chase in National Lampoon’s Christmas Vacation, have a HAP-HAP-HAPPY CHRISTMAS! 2 Comments for "Christmas 2013"
Thank you very much! Should be another post in a few days!